Once in a while, even though you know a sad time is imminent, it sneaks up and slaps you in the face anyway. And it really doesn’t matter whether you know it’s coming or not–you’re not ready. But as we all know, if you’ve lost someone personally, it’s yourself you feel sorry for, how much you’ll miss life without that cherished person. So I admit, I certainly don’t want to deprive or delay the joys of heaven for my son. But I just wasn’t through loving him yet. Trent was a champion. He fought against the rigors of seizures which began when he was barely one year old. 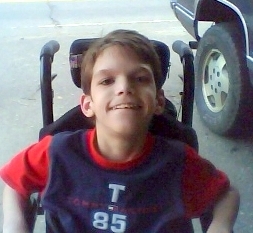 Cerebral palsy was diagnosed around the same time as the epilepsy, then mental retardation, then mirror movement disorder, at which point multiple disabilities began to fight for supremacy in his little life. Rather than those little discoveries of “oh, look, he’s crawling” or “how sweet, he just learned to climb” it was more a matter of “oh no, here comes another seizure.” Multiple doctor visits, multiple ER episodes, constant switching of medications to help him manage, the side effects from those a nightmare on their own…his life became a battle that he endured with the sweetest grace. His favorite toy? His little brother Dalton, one year and 23 days younger and full of exuberance and love for Trent. Dalton learned from a very early age to nurture and care for his big brother, “Boo”. Boobers, as he became known to nurses and the kindest doctors, charmed every last one of them from his wheel chair. The ravages of disease left him too weak to walk, so an attempt was made to strengthen his hipbones by inserting steel pins in surgery. Trent was left in a huge cast with a bar connecting his calves so that he could develop straight legs and a strengthened pelvis. This did not work. His mode of ambulation was to sit on his knees on the floor, and either lean forward and sort of leap frog or scoot a few inches ahead, then repeat the process, or when tiring of that move he would lie down on his back, drawing up his knees and pushing with his feet, knees in the air, and “scoot” around the house. But to do this he had to look backwards, to see where his feet were shoving him, so he kept his neck arched to see where he was heading. If this sounds awkward to you, just don’t get in his way, he can get up to a pretty good speed when he wants to leave the room. Noisy going’s on bothered him a bit, lots of company or a shoot-em up tv program, even a vacuum cleaner or other appliance would send Trent scooting off down the hall to find a quieter atmosphere. But we found to my delight one day that if you settle on CMT’s video’s and Shania Twain comes on, just the first few notes of “Any Man of Mine” will bring him scurrying back to the TV set as quickly as he can go! I know, I know, I’m confusing past tense and present tense. He lost his battle with disease on New Years’ Eve, December 31, 2012, and was buried in Calhoun, Georgia on January 4, 2013. I guess that’s because my perspective isn’t temporal, it’s eternal. Trent’s not gone. He still exists. He’s actually sleeping according to Scripture, waiting to meet Jesus in the air when we are raptured out of here together. I know that. So he’s not a “was”. He’s an amazing young man who will get a special pass straight to Jesus’s arms because of all he’s endured in this life. The only one I feel sorry for tonight is me, since I have to wait for awhile right here. That’s okay, Trent. You go first, I’ll wait here till He comes, then we’re goin’ cloud-hopping all the way to heaven! What Did You Do with Your Sister? These are my best friends: Jack, Seth, Ivy, Jenni, and Shannon. And this is one of their best performances–the Southwest Christian Church’s Christmas Pageant of 1979. They did an excellent job, once they understood what to do. But the first day of practice we almost had a meltdown. The teacher was coaching all the kids on where to stand on the risers, how to stand up straight and sing out, and so on. She had to stop frequently to call down one or another who misbehaved, frowning and calling them by name. I didn’t know most of the kids, but was watching the rehearsal with my fingers crossed–it was our first group effort and one of mine was terminally shy. I didn’t realize that one of the 12-year old boys cutting up on the top row of the bleachers was named Shannon also. When I explained it to her, she said, “How did I get a BOY’S NAME?? ?” about as irate as I had ever seen her. Once we had that little problem explained away, the play went off without a hitch. We weren’t always 5, you know. One of the funniest days I can remember is when they were only 3–three kids, that is. Jack, the oldest, was almost 3 years old, and his cohorts in crime, the twins Ivy and Seth (to the right of Jack in the photo) were 2. They shared one bedroom, the twins in their little portacribs, Jack in a “big boys’ twin bed. I had to keep on my toes as I picked my way through the toys strewn all over the little house we shared, as they had the run of the whole place. One minute they were banging on all my best pots with spoons, marching in the band; next they were crawling along behind the sofa and recliner, one sock hanging out of the back waist of their pajama pants and the other held between their teeth. Elephants on parade. I was tickled at their antics as I put away laundry, picked up toys, stacked books back on the shelf. Then I noticed that it had grown quiet. I peeked around the corner and saw both boys, sitting quietly side by side and putting together lego’s to make a fort to protect their dinosaurs. “Where’s Ivy, guys?” I asked. They both shrugged and kept on building. “Come on, where did she go? Is she under the bed?” I asked as I looked around, behind the Fisher Price kitchen, beneath a stack of blankets—the giant’s mountain, I believe. Seth looked at Jack. Jack looked at Seth. They grinned in the funniest way. I was starting to get worried, and ran through the house, calling Ivy’s name. She didn’t answer. Not in the bathroom. Not in my room, not in the kitchen. Okay, this wasn’t funny anymore. I ran back into their bedroom, using my best ‘mama’s angry’ voice. “Where is she? Tell me right now. Seth struggled to his feet, looked up at me smiling and walked over to the bottom drawer of the chest. “Here,” he said as he led me over to the old maple chest where we kept their clothes. He tugged on the bottom drawer but couldn’t budge it. Thinking he had gotten a larger toy stuck in the way, I reached down to help him get the drawer open and found a quiet little mouse of a strawberry blonde, smiling up at me, not making a sound. She was curled up, fetal position on her side, althouogh she fit pretty well into the space. My heart stopped, eyes welling up, that mad-and-glad feeling you get. “What are you doing?” I cried, lifting her out of the drawer, practically squeezing the life out of her, the relief a bit shaky in my voice. And they wonder why we go gray.